Yes today is Valentine's Day. Like Halloween, it isn't something we really do in our house. Husband and I certainly don't do presents. Cards, maybe, at a push though this year is the first year in a while I've bought him a card just because I found this one. Instead we share nice food. He might cook the evening meal. I will bake a little something. And obviously whenever I bake I always bake for love. 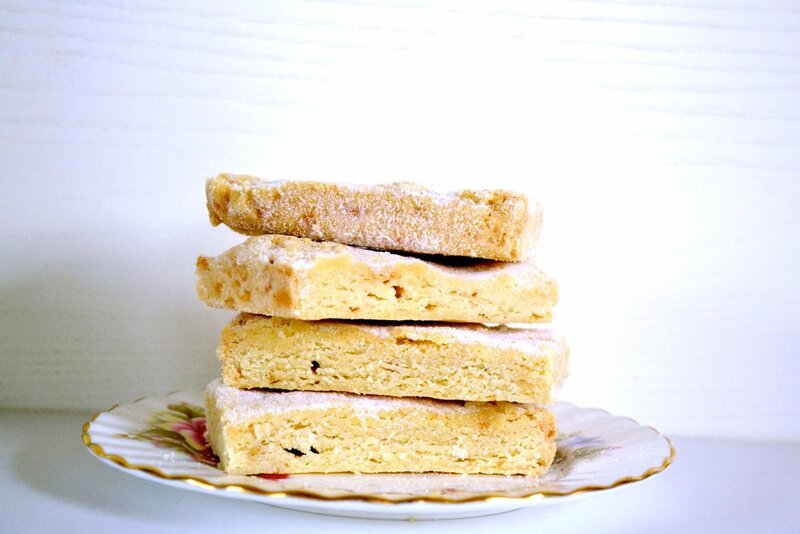 I adore homemade shortbread. I can eat it plain but there is something rather delicious about coming across a chunk of white chocolate that has been almost caramelised by the baking. Of course, you could also substitute the white chocolate for dark, milk, chocolate orange or even mini eggs. Pre-heat oven to 140 fan. Grease your tin or line with baking parchment. In a bowl measure out the flour and add the butter in small chunks. Rub together to make breadcrumbs with your fingers. Stir in the caster sugar, white chocolate chunks and vanilla. Pour the crumble mixture into the tin and press down hard with your hands. Place in the oven for 30-40 minutes. Remove from oven, scatter with a little more golden caster sugar and allow to cool slightly before cutting into squares.